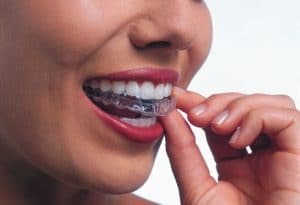 Busting Invisalign Myths…It can be a scary experience when you are given a referral to see an orthodontist or considering improving your smile. Braces are grounds for embarrassment for the self-conscious teen and the up-and-coming professional. Having a mouth full of metal to clean around, eat around, and live around can be daunting. The option that many may overlook when searching for orthodontic treatment is Invisalign, the nearly invisible alternative to braces. Some people may write this treatment option off due to price or success rate – but we’re here to bust those Invisalign myths! Often times, Invisalign is as cost effective as traditional braces – and you will have the doctors at Hidden Valley Orthodontics working by your side who are orthodontic specialists in the movement of teeth and jaw development to ensure success. This is important with so much misinformation being distributed on the Internet today with “do it yourself orthodontics” that cause major long term dental health issues. Your Invisalign aligners are customized to fit your mouth. We use advanced 3-D computer imaging technology to replicate an exact impression of your teeth and surrounding tissue. This allows us to customize each aligner so that it fits your mouth and over time moves your teeth into the proper position. During treatment, the visits are shorter than the average braces visit, they are less frequent, and discomfort is reduced. You will begin to notice a significant difference even before your treatment is completed. Most treatments are complete within one year; however this can vary from patient to patient. One of the advantages of Invisalign is the freedom patients have while maintaining the health of their smile. Often times, patients with braces have a difficult time keeping their teeth and braces clean – and some neglect it all together. With Invisalign, the aligners can be taken out while eating, playing sports, and during cleaning. This allows for an easier and more effective experience. Teeth and aligners should be cleaned after every meal to guarantee proper dental health. Keep in mind that your aligners should be worn for a minimum of 20 hours throughout the day. Your orthodontist will be able to tell if you have not been keeping up with treatment! For the non-believers, some may say that Invisalign is not as effective as traditional braces. With the latest advances in Invisalign technology, treatment success can be as satisfying as that of someone who has braces. In fact, many patients will finish on time, or even early with their treatment! Plus… the flexibility of Invisalign improves self-confidence and encourages patients to cooperate with their treatment and cleaning while experiencing a metal-free mouth when working toward a perfect smile. Not all patients are candidates for Invisalign. However, we encourage you to contact the team at Hidden Valley Orthodontics for a free smile exam to find out if Invisalign is the right choice for you! We are out to bust those Invisalign myths. We offer many different orthodontic treatment options to provide you with a “Smile that Last a Lifetime”.